Last week Microsoft announced the availability of Office on iPhone – sort of. It’s not a typical installation of Word or Excel on your iPhone, but actually part of Microsoft’s new Office 365 subscription model. But, you don’t need a subscription to use Office on your iOS device. 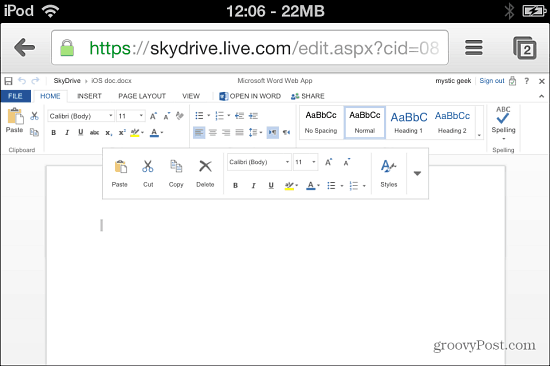 Since Microsoft introduced its free Office Web Apps, anyone with a browser and Internet connection can use SkyDrive.com to create and share Office documents. That includes anyone on a PC, Mac, Linux, Android, BlackBerry, and of course iOS. The benefit of the new Mobile Office app on iPhone is that it’s optimized for the smaller display. But, if you can get past that, and pinch and zoom your documents, using Web Apps via a browser might be enough to get things done on the go. Note: Microsoft added touch support to Web Apps for Mobile Safari, as we showed in our article: How to Edit Office Docs on iPad. You can also create and share documents with friends and coworkers on Facebook easily with the Docs.com Beta from Microsoft Fuse Labs. 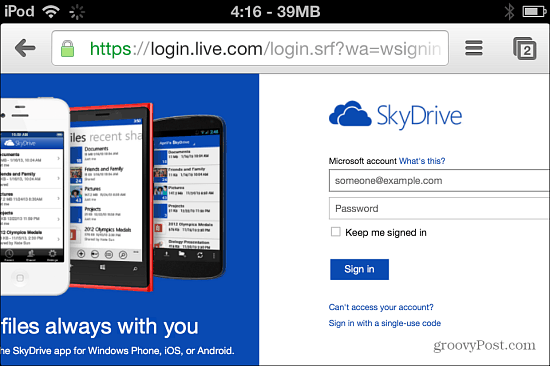 To start, simply go to SkyDrive.com in Safari or Chrome on your iPhone, iPad, or iPod touch and log in to your Microsoft Account. 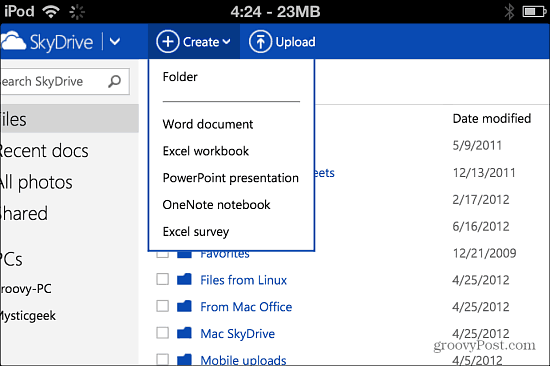 Tap create from the top toolbar and you’ll get a dropdown list to create Word, Excel, PowerPoint, and OneNote files. Office Web Apps are based on HTML 5 and you can create new files just like you would with Office on your computer. Web Apps don’t have all of the features available in the desktop versions, but there’s certainly enough to get basic to intermediate work done in documents and spreadsheets. An Office 365 subscription will cost you $9.99/month or $99/year for the Home Premium version. The Office Mobile app on iPhone includes Excel, Word, and PowerPoint. Then there’s separate app for OneNote on iOS and manage email via the Outlook.com. I haven’t tried it out yet, but this video gives you an idea of what you can expect if you are a 365 subscriber.